Samuel Lewis "Sam" Cunningham, Jr (born August 15, 1950) is a retired American football fullback. The media referred to him as Sam "Bam" Cunningham. 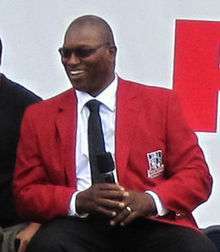 Cunningham was a letterman for University of Southern California's football team from 1970 through 1972 where he played fullback. He was named an All-American in 1972. He was a member of USC’s 1972 national championship team. In the 1973 Rose Bowl, he scored four touchdowns, which still stands as a modern-day Rose Bowl record. He was named Rose Bowl Player of the Game. He was inducted into the Rose Bowl Hall of Fame in 1992 and into the College Football Hall of Fame in 2010. In 1970 he was part of USC's "all-black" backfield (the first one of its kind in Division I (NCAA) history), that included quarterback Jimmy Jones and running back Clarence Davis. He had a notable debut performance (135 yards, 2 touchdowns) against an all-white University of Alabama football team, as USC beat Alabama 42-21 in Birmingham on September 12, 1970. His performance in the game was reportedly a factor in convincing the University of Alabama and its fans to let Coach Bear Bryant integrate Southern football. Jerry Claiborne, a former Bryant assistant, said, "Sam Cunningham did more to integrate Alabama in 60 minutes than Martin Luther King did in 20 years." In only his second year 1974, he gained 811 yards and 9 touchdowns as he led the New England Patriots to a surprising 4-0 start before faltering to a 7-7 finish. In 1977 he gained a career high 1,015 yards and scored 4 touchdowns, and also caught 42 receptions for 370 yards and a touchdown. He played his entire career (1973 through 1982) with the Patriots and was a 1978 Pro Bowl selection. Cunningham finished his career with 5,453 rushing yards, 210 receptions for 1,905 yards, and 49 touchdowns. He is the older brother of former UNLV and NFL quarterback (and All-America punter and Pro Bowl quarterback) Randall Cunningham and uncle of Randall Cunningham II and world champion high jumper Vashti Cunningham. Cunningham is the 2010 Inductee to the Patriots Hall of Fame. ↑ Chapin, Dwight - McKay's Message Puts the Bam Back in Sam. Los Angeles Times, October 15, 1971. "The name-Sam (Bam) Cunningham--makes you think of a big guy crunching through tacklers like a truck going through a plate glass window." ↑ Schoen, David (2013-04-11). "Gorman siblings not burdened by celebrated name". Las Vegas Review-Journal. Retrieved 2013-09-06.